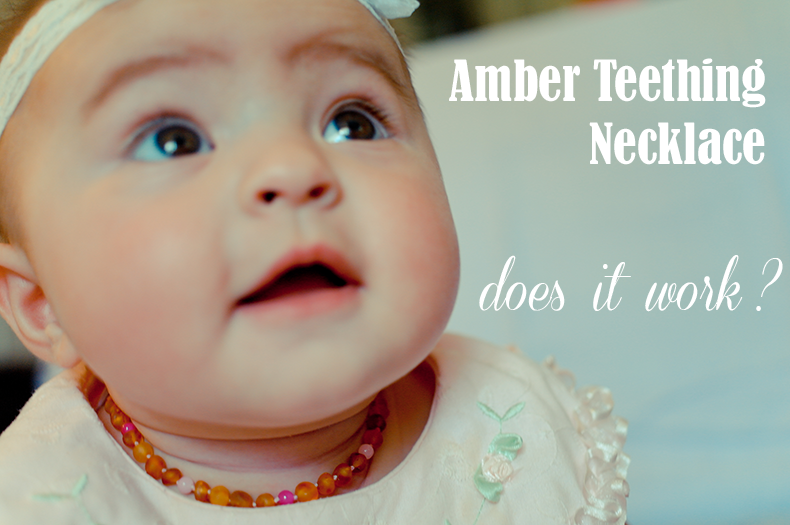 I have always been intrigued by the idea of amber teething necklaces, though I certainly wasn't a firm believer in their healing / anesthetic power. It took some research and talking to fellow moms to convince myself to give this idea a try. 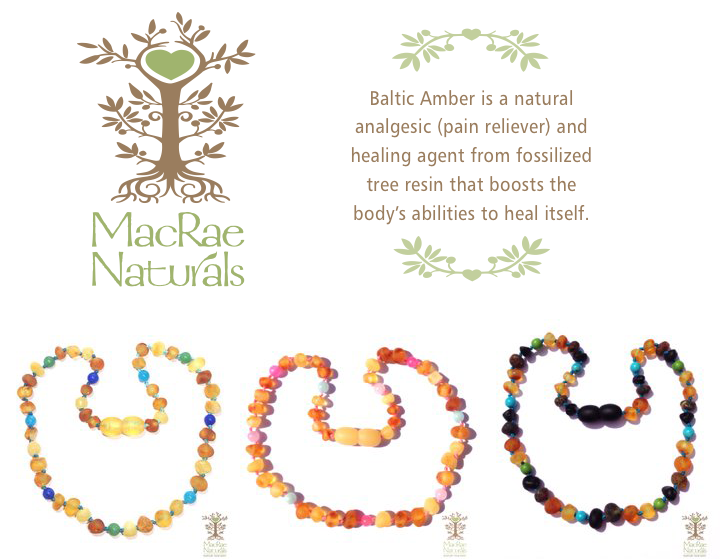 The wonderful Kimberly from MacRae Naturals offered to send me one of her gorgeous hand-made teething necklaces to test out and then share my honest thoughts about it - thank you Kimberly! This was just the perfect opportunity to see if these things actually make a difference - and, as it turned out, just the thing Victoria needed! So did it make a difference for us? I believe so. Just 3 days after we put it on, we noticed Victoria wasn't drooling as much and within a week she stopped drooling altogether. And I am pretty sure the lack of drool can be attributed to the necklace, as I did try taking it off for a couple of days and the drool was back. Then after putting it back on, it was gone within 2 days. Just like magic. Did it help with the pain? The itching? I can't say for sure that it did (it's not like the baby can tell me, right? ), though it certainly looked as if my daughter was in less pain. She was less agitated, went back to sleeping 10-11 hours at night, and chewed less on her teethers (before they were in use 90% of her waking time and she would bite down on them with incredible viciousness). I heard horror stories about teething babies - their painful screams, sleepless nights, fever, crankiness, tears.. I was dreading the moment my daughter first tooth would break through. I expected a living hell! And you know what? It honestly wasn't that bad. It wasn't bad at all! Call me crazy or naive, but I really believe the necklace made a huge difference. Victoria started wearing hers at about 6 months old. She is now almost 16 months old and she recently got her molars out! And we haven't had a single sleepless night, she did not break out in fever, she was merely occasionally agitated (and where the necklace didn't help, the various teethers came to the rescue), we didn't have to give her any pain medication - not even a single time - and she was just really content and cheerful throughout the whole thing. I was amazed and speechless. So do I recommend buying one for your child? Absolutely! Why wouldn't you? Even if for whatever reason it won't work as well on your child as it did on mine, it still won't hurt to try, right? And it's beautiful, fashionable and completely safe (even to sleep with it on). And - very affordable! Is it safe? Can my baby wear it to sleep? The way the necklace is made - each bead has knots on both sides - ensures that even if the necklace breaks, only one bead will come loose and the rest of them will stay intact. 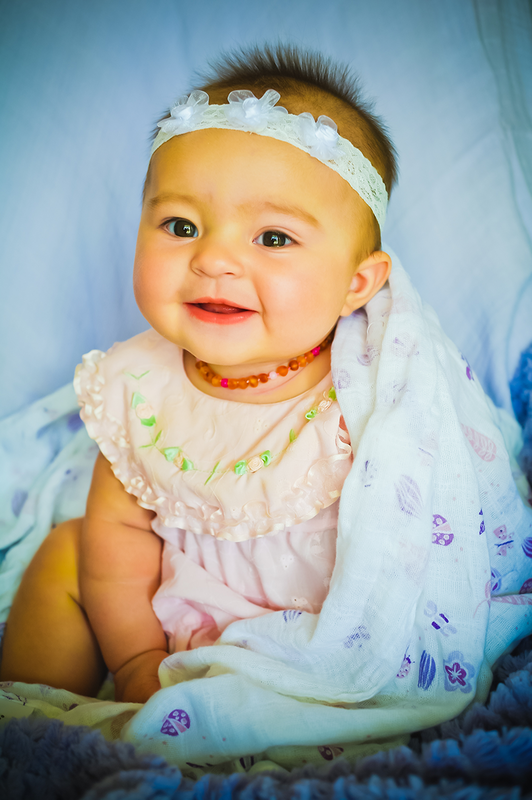 The necklace is just the perfect length for your baby's neck - not too long but just perfectly snuggly, with just a little bit of wiggle room for comfort. Your baby won't be able to put the necklace in her mouth and I have never seen Victoria actually grabbing it and trying to pull it. The beads are small enough not to cause any discomfort while lying down. On her page, Kimberly advises to always remove the necklace before bathing and sleeping, though I must say we didn't take it off for Victoria's naps and she was sleeping with it on just fine. Still, it's better to be safe than sorry. Kimberly also says that: "The beads are the size of a pea or smaller and in the highly unlikely event the string breaks, they are small enough that if eaten they can be passed without harm." If you have any other questions or concerns, I recommend to check out Kimberly's helpful FAQ on the MacRaeNaturals.com website, or just ask Kimberly directly - she is very helpful and wonderful to talk to, and will get back to you super fast! Kimberly, the founder and owner of MacRae Naturals, is a stay at home mom who runs her business all by herself. She is very passionate about helping moms and children get through the hard teething time. Her store bursts with amazing, carefully put together necklaces for both children and moms. She continues to add new items to the store all the time. You can find her on INSTAGRAM, where she often posts beautiful pictures of the necklaces as she adds them to the store!